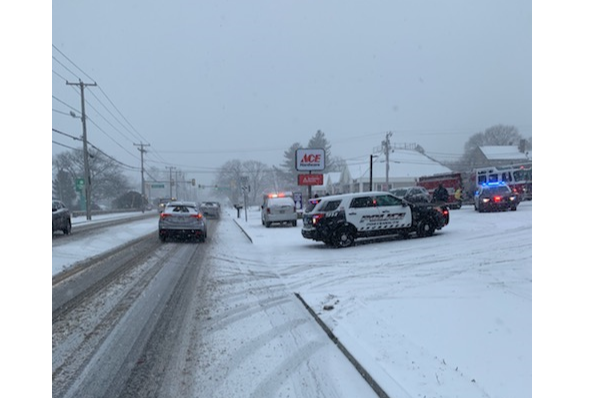 As car accidents are occurring across the area due to the snow, Police are investigating an accident where two pedestrians were hit by a car. According to Detective Lieutenant Michael Arnold, on February 12th at 1:18 p.m., the Portsmouth Police were dispatched to the area of East Main Road across from Citizens Bank for a report of two pedestrians that were struck by a motor vehicle. Upon police arrival, it was revealed that a 2006 Silver Jeep operated by a 32-year-old male and a 2011 green Jeep operated by an 18-year-old female were involved in the accident. The 2011 Jeep was attempting to turn off East Main Rd and into the parking lot of ACE Hardware, when the 2006 Jeep operating south bound behind that vehicle attempted to slow down; however, due to the snow and slick conditions slid on the roadway and veered into two female juvenile pedestrians that were walking across the parking lot. The two juveniles complained of pain and were transported to a local hospital.